Thomas R. Marshall is not a household name anymore, even in his native Indiana. But a hundred years ago, from 1913 to 1921, this former Hoosier governor served as Vice President of the United States. If Woodrow Wilson had ever died in office, Marshall would have become Indiana’s second native son to serve as Commander-in-Chief. As fate had it, though, the Vice President himself had to contend with threats from “cranks” and would-be assassins. Most were probably hoaxes. But the man who actually dynamited Marshall’s office in 1915 turned out to be a strange “crank” indeed. 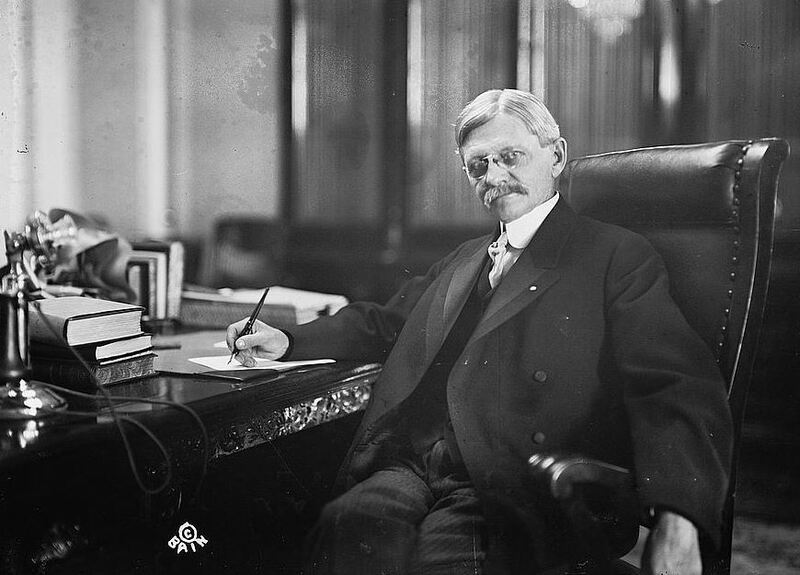 In July 1915, just a few days after an explosion rocked the U.S. Senate outside his private office there, the V.P. told the press that he had been getting death-threats in the mail for at least six weeks. 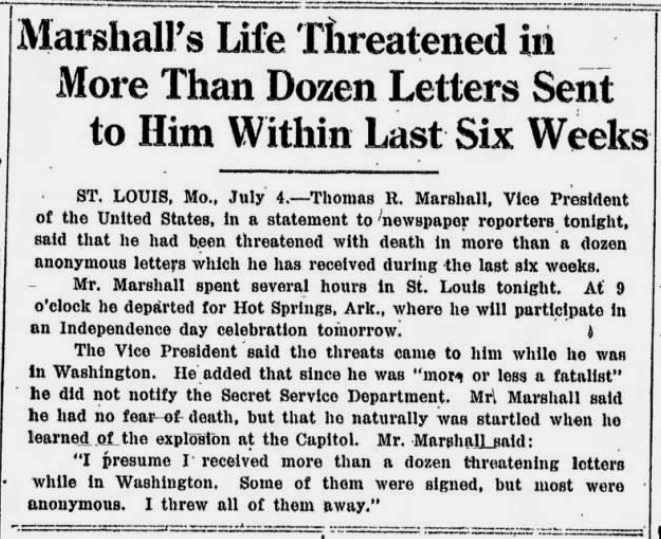 Marshall considered himself “more or less a fatalist” and ignored these threats from “cranks.” He threw the letters in the trash and never even informed the Secret Service. 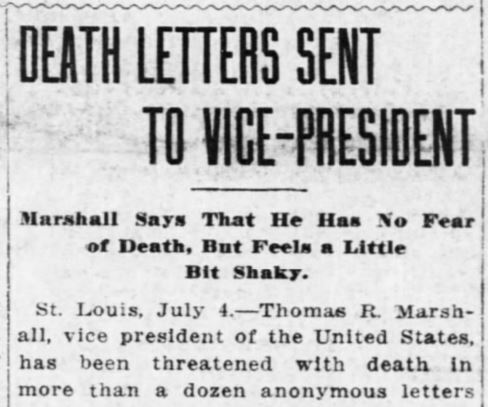 Because those letters went straight to the waste bin, it’s hard to say if there was any connection to the man who dynamited the Senate just outside his private office door a few minutes before midnight on July 2, 1915. If John Schrank and John Hinckley’s motivation behind their attempts to shoot Teddy Roosevelt and Ronald Reagan seemed far-fetched — Schrank was told to do it by the ghost of William McKinley in a dream, and Hinckley wanted to impress actress Jodi Foster — the story behind Erich Muenter’s attack on the U.S. Capitol is even weirder. At a time when nativists wanted to shut off immigration to the poor, Muenter — an immigrant — had taught at Harvard and Cornell. He was also a wife-murderer, an Ivy League scholar, and lived an incredible double-life. 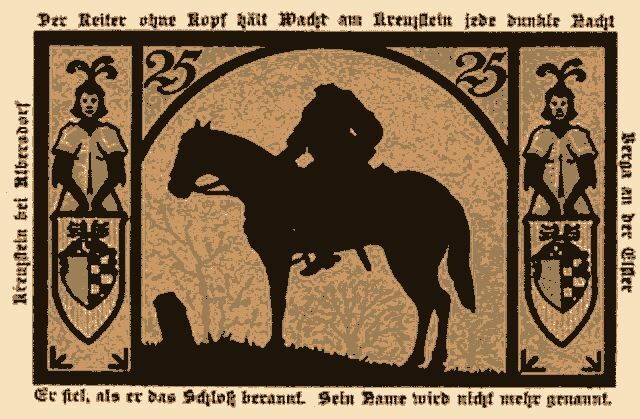 Maybe the expert on German literature knew a bizarre tale by E.T.A. Hoffmann, The Life and Opinions of Tomcat Murr, told when a printer accidentally spliced together an artist’s autobiography and the views of an opinionated tomcat. Erich Muenter was born in Germany and immigrated to Chicago with his parents at age eighteen. He studied languages at the University of Chicago, graduating in 1899, then taught at the University of Kansas for a year before moving to Harvard in 1904, where he was a star doctoral student. In Chicago in 1901, he had married Leone Krembs, daughter of a rich Milwaukee druggist. Friends in Kansas considered Muenter brilliant and thought that he knew virtually “every living language.” The Muenters were hugely popular with students and faculty both at Kansas and Harvard. 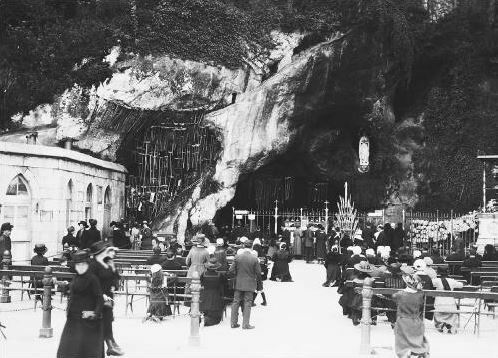 The couple, it is thought, were “mystics” and Christian Scientists, rejecting medication in favor of faith healing. When Leone died in Cambridge, Massachusetts, in April 1906, a few days after giving birth to a daughter, Muenter — who had been slowly poisoning her with arsenic — thought that Christian Science gave him the perfect cover-up, but hastily tried to ship the body to Leona’s parents in Chicago for burial. A Massachusetts doctor, however, performed a secret autopsy and uncovered traces of poison in her stomach. Now dubbed the “Harvard wife murder,” Muenter fled from the law. 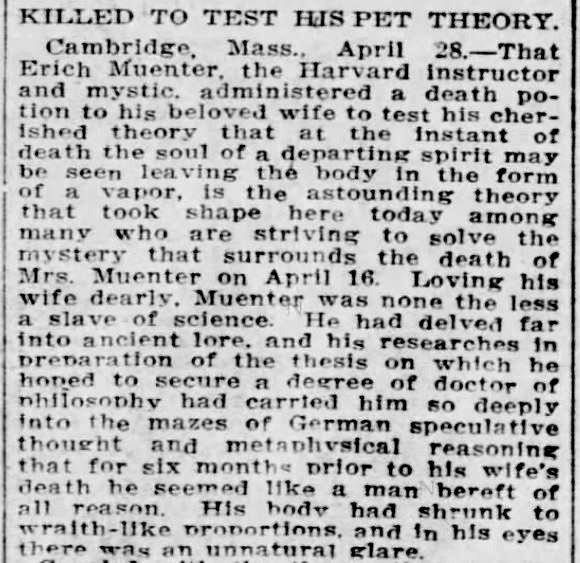 In spring 1906, he became a national news sensation, with some papers touting spectacular, tabloid-like theories about why he had killed his wife. One theory had it that Muenter, like Goethe’s Faust, was a “slave to science” and had taken the hunt for knowledge too far. Guilty or not, the fugitive eventually slipped over the border to Mexico, where he hid out for a few years, working as a bookkeeper at a mining operation outside Mexico City. 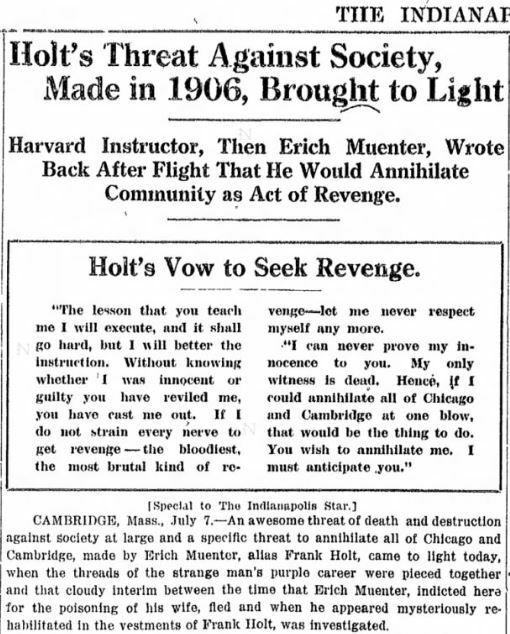 Some time before 1912, under the alias “Frank Holt,” he came back to the U.S. and re-invented himself — as another version of Erich Muenter. Holt, incredibly, even enrolled at Texas Tech as an undergrad in the German department. The former Harvard instructor naturally shone as a star student in College Station. And Muenter/Holt must have had a thing for women named Leona, since he married a fellow language student, Leona Sensabaugh, daughter of a prominent Methodist minister in Dallas. 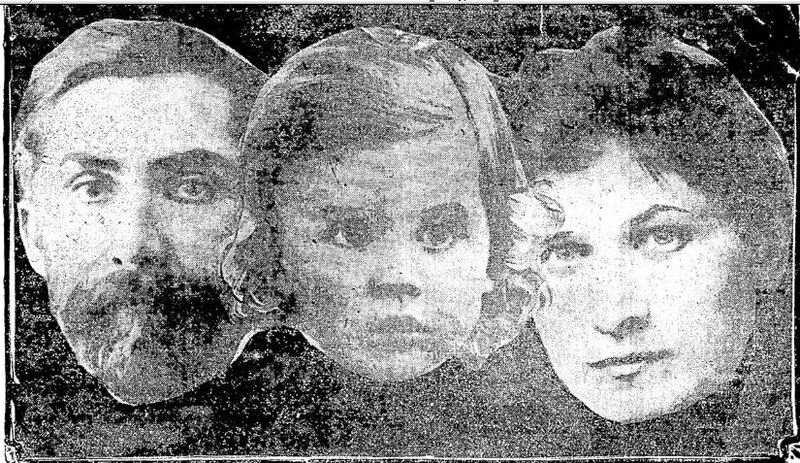 The Holts had three children together. Leona Holt went on to teach Latin American literature at Southern Methodist University and eventually became its dean of women. After teaching at SMU himself, Frank Holt returned to the Ivy League, landing positions at Vanderbilt and Cornell. So it was that less than a decade after he killed his first wife, he returned to academia… by another route and as another man. Muenter/Holt had also become a German nationalist. Though President Wilson was trying hard to keep America out of the bloodbath of World War I, many Americans thought the U.S. should enter on the side of Britain. Others favored Germany. Socialists almost universally opposed any American involvement at all, arguing that the war only played into the interests of Wall Street. Anarchists agreed. Some pro-British Americans were already turning a profit from the war by shipping munitions to the Allies, often secretly. A load of illegal explosives allegedly sent aboard the passenger liner Lusitania led a German U-Boat to torpedo it just two months before Erich Muenter dynamited the Senate. Germany and its U.S. sympathizers considered this version of “neutrality” a sham. Some went to extremes to protest it. In 1915, “Frank Holt,” Cornell University professor, read a book by a former Harvard colleague of his — from back when Holt was Erich Muenter. The book was The War and America by Hugo Münsterberg, a well-known pioneer in forensic psychology and a German sympathizer. (In 1918, Münsterberg’s book showed up on a list of pro-German works banned from Indiana libraries.) Convinced by Münsterberg’s argument and angered by American financiers’ profiting off the war, Frank Holt offered his services to the American branch of the German intelligence unit Abteilung IIIB. Founded in 1889, this was a long-standing military spy unit, but during World War I it worked to sabotage arms-carrying vessels departing from U.S. ports. The unit also allegedly supported Erich Muenter’s attack on the Capitol Building — then on J.P. Morgan, Jr., Wall Street mogul. 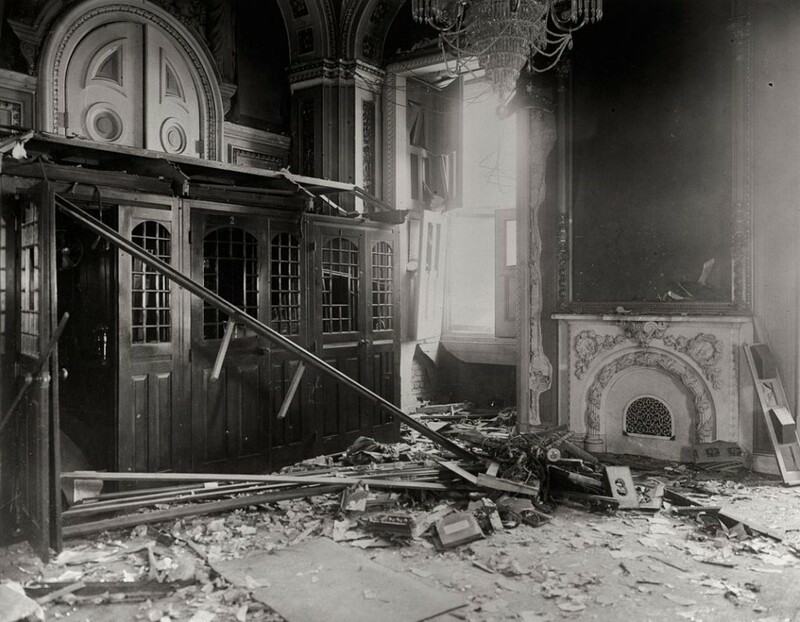 On the night of July 2, 1915, Muenter broke into the Capitol with three sticks of concealed dynamite. The Senate was actually out of session and few people were in the building other than a nightwatchman. Finding the door to the Senate chamber locked, Muenter set the package under a telephone switchboard next to Vice President Marshall’s office. Reports differ, but the attacker then either set the timer for just before midnight “to minimize casualties” or the timer went off eight hours early. He then boarded a train from Union Station bound for New York City. The blast that ensued at 11:23 PM rocked the Capitol. The watchman and other witnesses thought the great dome was collapsing. In reality, damage spread little farther than the Senate Reception Room and Thomas Marshall’s office. No one was injured. 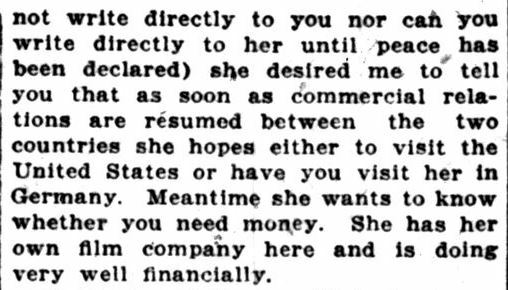 Using a pseudonym, Muenter mailed a letter to The Washington Evening Star, expressing anger at American financiers. The dynamiter argued that he didn’t want to kill anybody, even posing as a friend to America who wanted to save lives and “make enough noise to be heard above the voices that clamor for war. 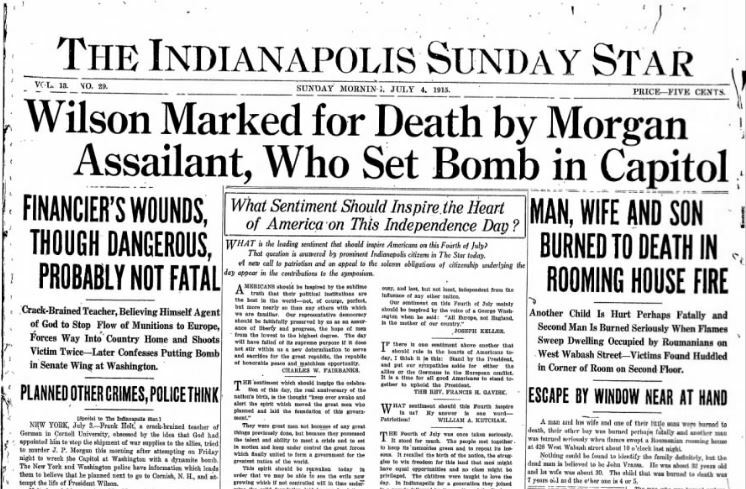 This explosion is an exclamation point in my appeal for peace.” Some papers later called him a “Christian” and a “peace crank.” The anti-war American Socialist press even appears to have sympathized with Holt. 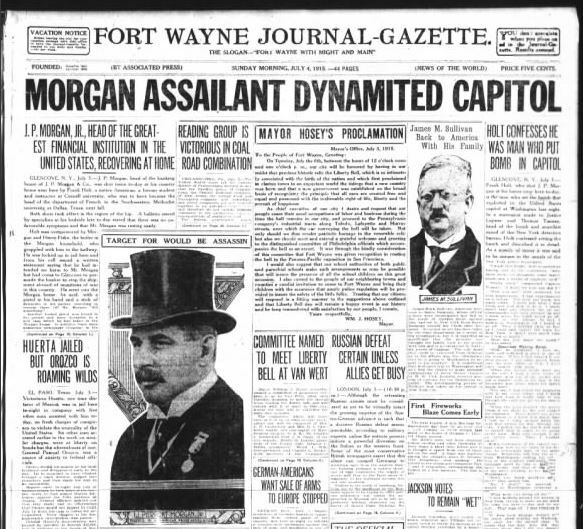 Indiana’s Thomas Marshall confessed that “he naturally was startled when he heard of the explosion at the Capitol,” but didn’t think there was any “special significance” in the fact that the dynamite had been placed “within a few feet of his desk.” Muenter, in fact, was probably bluffing when he told the police that he’d sought to blow up the Vice President. Marshall was headed to St. Louis and Hot Springs, Arkansas, for Fourth of July festivities. J.P. Morgan, Jr., son of the great financier John Pierpont Morgan, was less fortunate than Marshall. 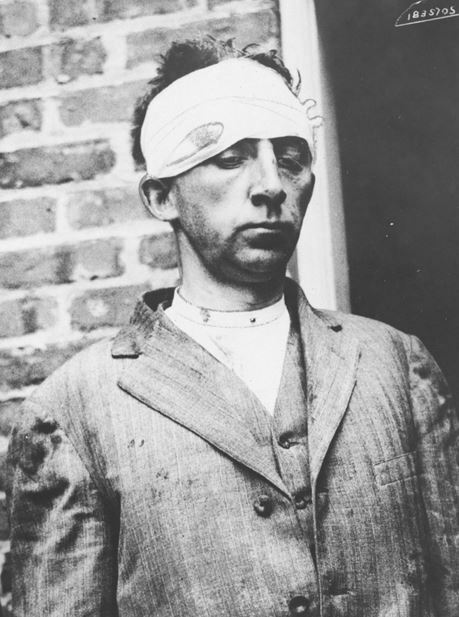 If Americans in 2016 are outraged by the actions of “banksters” and the “1%,” so too was Erich Muenter/Frank Holt a century ago — alongside many Americans less prone to engage in political assassination. 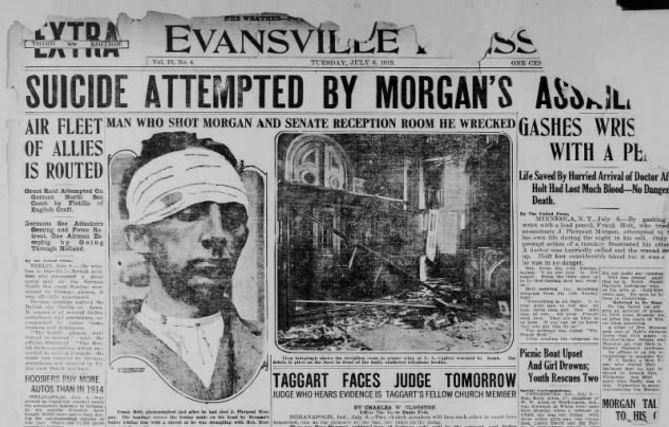 The morning after the Senate bombing, Muenter broke into Morgan’s estate on Long Island. An epitome of Wall Street, “Jack” Morgan was already reeling in millions of dollars from war loans to the Allies. He also arranged for ammunition from American manufacturers to be shipped on vessels to Britain. Regardless of what side was right or wrong in that war (probably neither was), Morgan’s profiteering jeopardized “neutral” shipping and American lives on the high seas. Angry at the millionaire, the strange language instructor — who had committed murder once before — took a gun and broke into Morgan’s mansion, where the Wall Street tycoon was having breakfast with the British ambassador, Sir Cecil Spring Rice. Muenter shot Morgan twice before servants subdued him with a lump of coal. 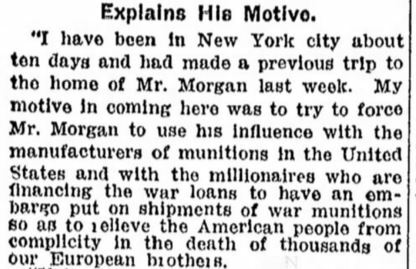 Press headlines announced that the “war-crazed crank” had also planned to take Morgan’s wife and children hostage until he and other tycoons agreed to stop financing the Allies. The banker survived. Muenter was hauled off for interrogation by the NYPD’s Bomb Squad, which normally tried to protect New Yorkers from attacks by anarchists. 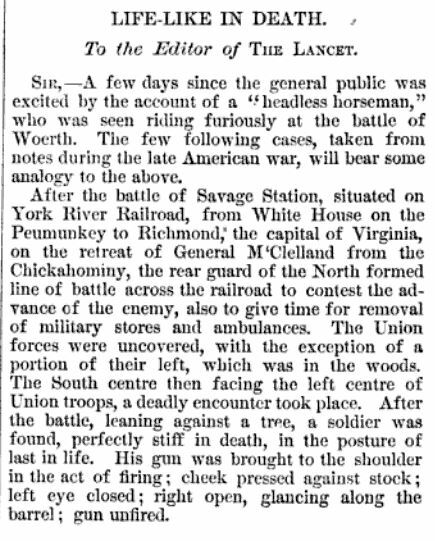 Early reports on the events in Washington and New York came just in time for the Fourth of July. 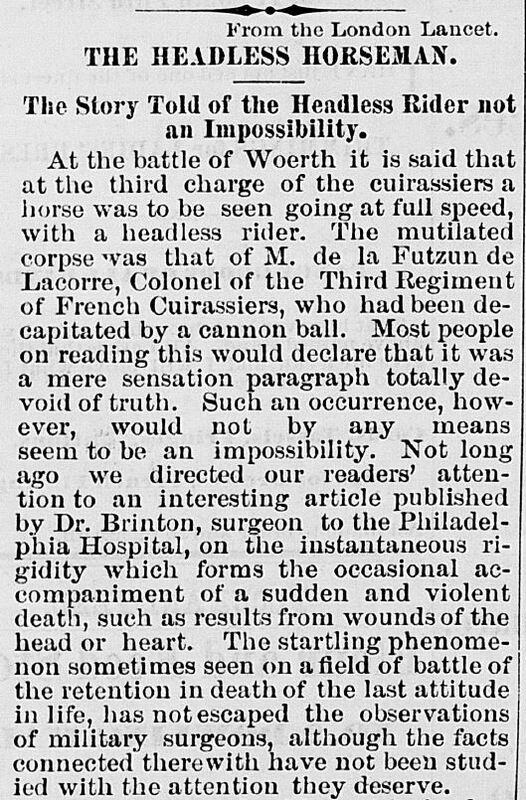 Newspapers were full of hasty rumors. 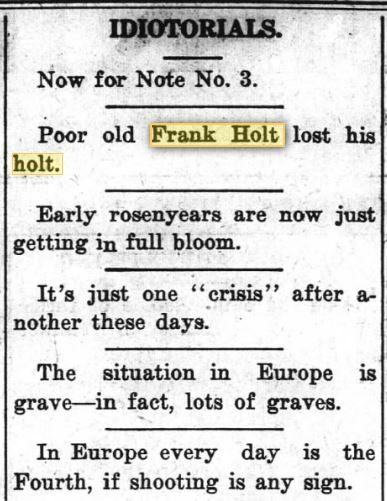 The Indianapolis Star told its readers that the would-be assassin, now identified as Frank Holt from Ithaca, was a “crack-brained teacher, believing himself the agent of God to stop the flow of munitions to Europe” — and that he had also targeted President Wilson, which was not true. Much of the news flashed through the press came from a confession Holt gave to a New York bomb detective. That confession made him seem like a pacifist, bent not on extinguishing but saving human lives. By July 6, investigators had begun to believe that Frank Holt was identical with the long-lost “Harvard Wife Murderer,” Erich Muenter, missing for nine years. As Muenter’s incredibly successful mask fell off, he tried to kill himself in jail, slashing his wrists with a lead pencil. The Cornell professor successfully committed suicide on July 6 at a jail in Mineola on Long Island by jumping to a concrete floor, though reports about his suicide varied, some saying that he cracked his skull and “dashed his brains out,” others claiming that he ate a percussion cap, since a loud explosion was heard in his cell. “Frank Holt” wrote a death note to his wife back in Texas, which read: “Pray that the slaughter will stop,” a reference to the European war. 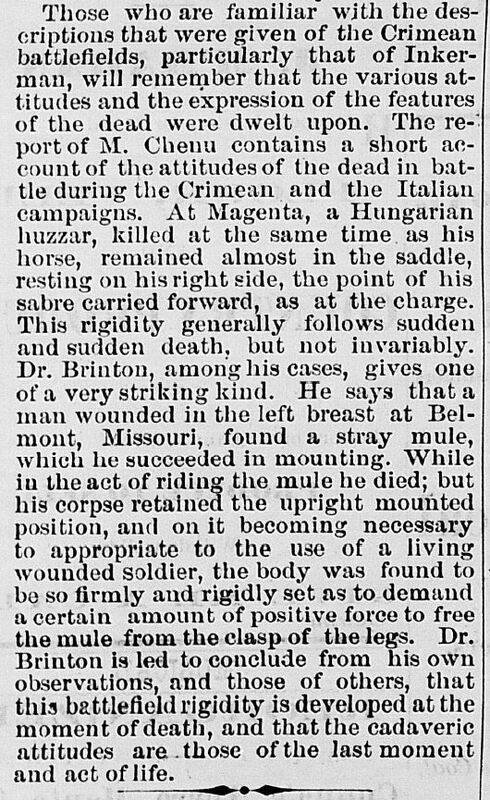 Newspapers reported that the dead man was slated to become head of Southern Methodist University’s French department that fall. A large cache of explosives thought to belong to him had just been found on West 38th Street in New York. 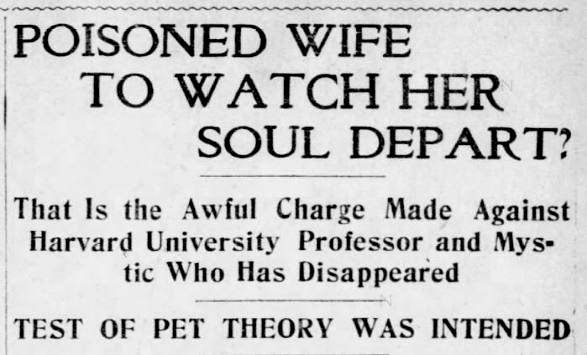 News readers must have been driven mad by the twists and turns of the thrilling tale, especially as the anti-war “agent of God” metamorphosed into a bizarre fugitive and “uxoricide” (wife-murderer), then an Ivy League professor, then… a ship bomber. 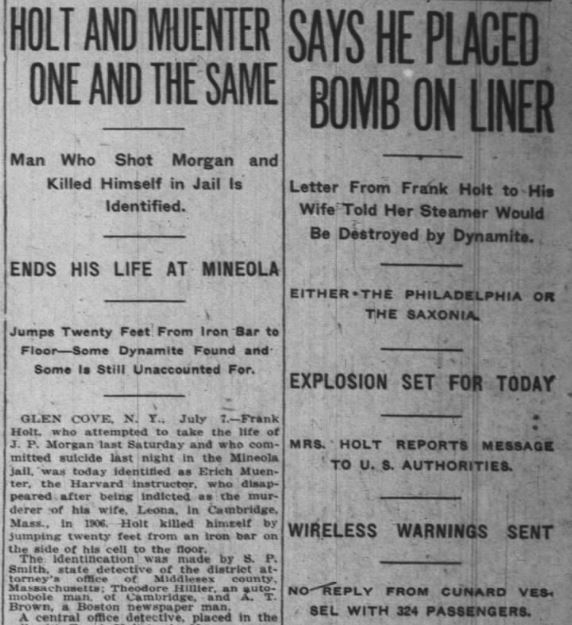 In his suicide note, Muenter told his wife that while en route from the U.S. Capitol to Long Island, he stopped in New York and put several half-pound sticks of dynamite on an oceangoing vessel bound for Europe. Holt didn’t say which vessel, but it was loaded with sailors and ammunition. Wireless signals frantically fired the information out to sea, warning captains and crew to search their cargo holds for a bomb. 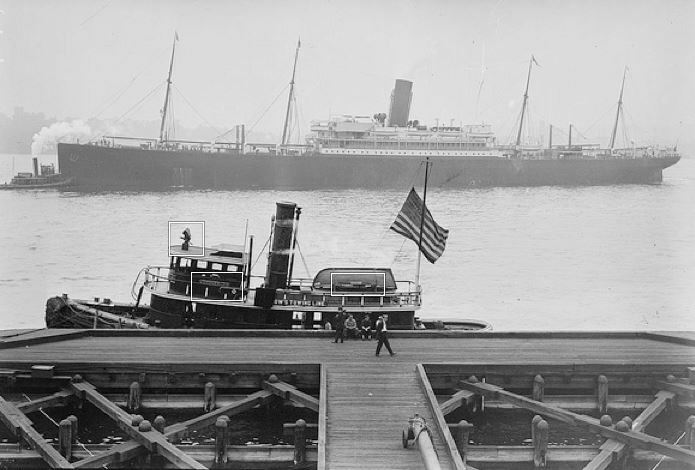 On July 9, 1915, two days after Muenter’s suicide and on the very day he predicted there would an explosion, the SS Minnehaha caught fire after a blast. (The Minnehaha had been built by the same Belfast company that constructed the Titanic and was once sailed on by Mark Twain.) The blast in the ship’s hold caused a dangerous fire but failed to ignite the high explosives on board. The vessel scurried into Halifax harbor. Ironically, two years later, in September 1917, the Minnehaha was torpedoed by a German U-boat off the southwest coast of Ireland, just a few miles from where the Lusitania went down with 1,200 innocent lives. Handwriting experts connected some more dots, giving further evidence that Frank Holt and Erich Muenter were one and the same. Back in Texas, Leona Holt was in shock. 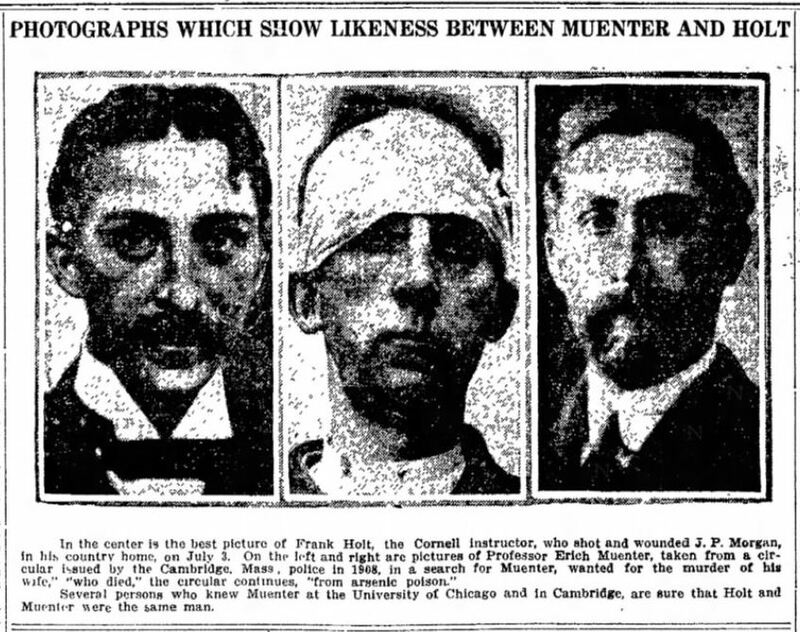 Her family refused to believe that Frank was the “Harvard wife murderer” — ironically, Muenter’s family and Chicago in-laws had had the same reaction after his first wife’s death in 1906. Leona blamed her husband’s severe headaches, overwork, and the effects of skeletal tuberculosis. She was also quick to urge that he “had no Socialist tendencies.” His father-in-law, Dr. O.F. Sensabaugh, insisted that Frank was from Wisconsin and, though he may have been a German sympathizer, he could never have been the Harvard poisoner. Touchingly, Sensabaugh added that even “If Holt really was a man who had dropped to life’s bottom — and I can’t believe it — I take my hat off to him for the way he came back. No man could have been a more lovable husband and father and a better friend than he was while I knew him.” Friends and family were convinced this was all an incredible case of mistaken identity. 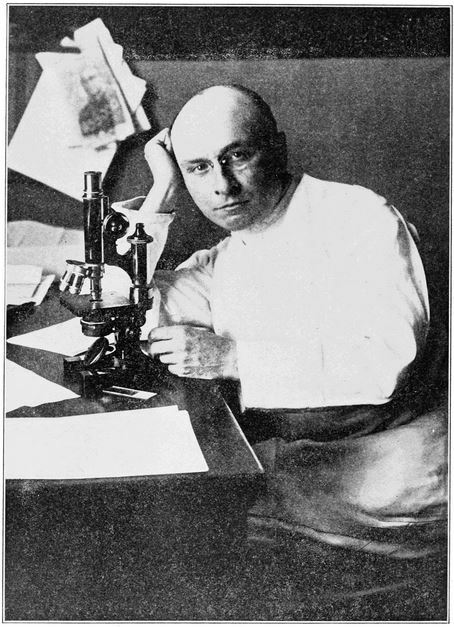 The press soon printed allegations that the fugitive Muenter, possibly a real psychopath after all, had sent a letter from New Orleans in 1906 threatening to “annihilate” Chicago and Cambridge for accusing him of poisoning his first wife — and that the real reason he fled Massachusetts was to escape the severe punishment that state inflicted on Christian Scientists whenever a death occurred after refusing medical treatment. The truth behind the tragic 1906 murder in New England — whose long shadow eventually spread over a Texas family, a powerful Wall Street tycoon, a U.S. vice-president, and others — may never be fully known. But Erich Muenter’s subterfuge led to one of the oddest and most twisted news stories ever covered by the press. 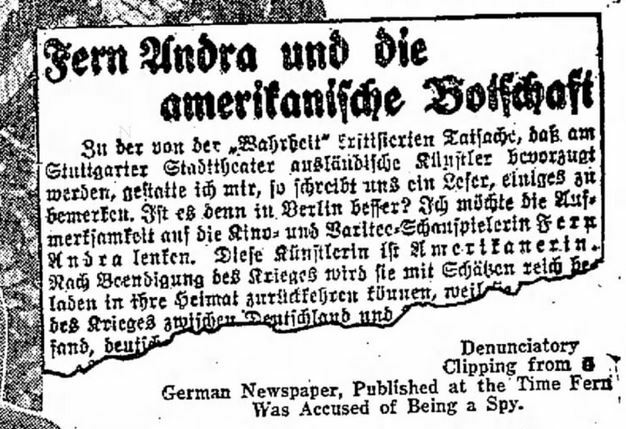 Whether Germany’s sympathizers were right or not, the actions of its saboteurs and spies on American soil — which led to some fascinating rumors about the Kaiser’s cross-dressers in New York — did nothing to help “the Fatherland.” By 1917, when America finally declared war on Germany, such actions and the press’ role in portraying “Hun barbarity” fueled the equally frightening anti-German hysteria that gripped the country. That’s the verdict of Die freie Enzyklopädie, Germany’s homegrown Wikipedia. Yet this actress who skyrocketed to about a decade of European fame wasn’t German. 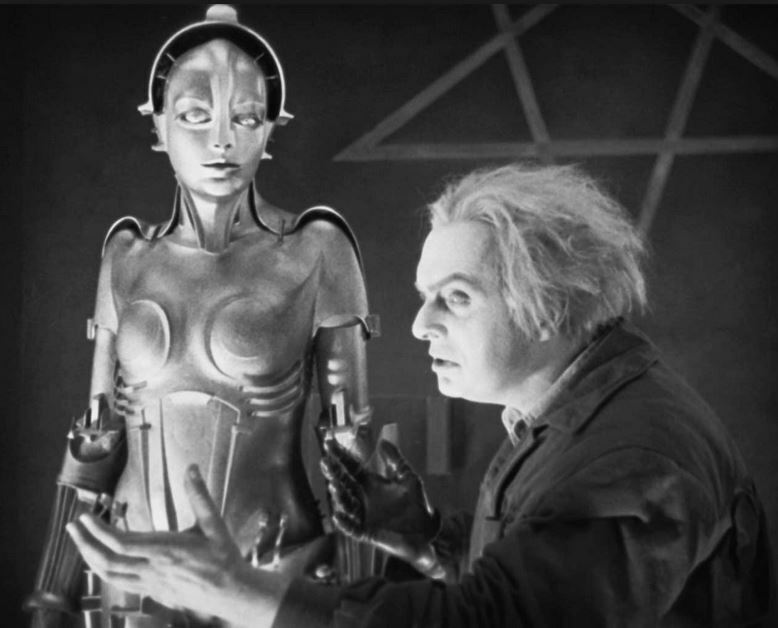 In the days when German Expressionism was pushing cinema forward — Fritz Lang’s Metropolis was probably the greatest film of the 1920s, alongside the silent horror classics Nosferatu by F.W. 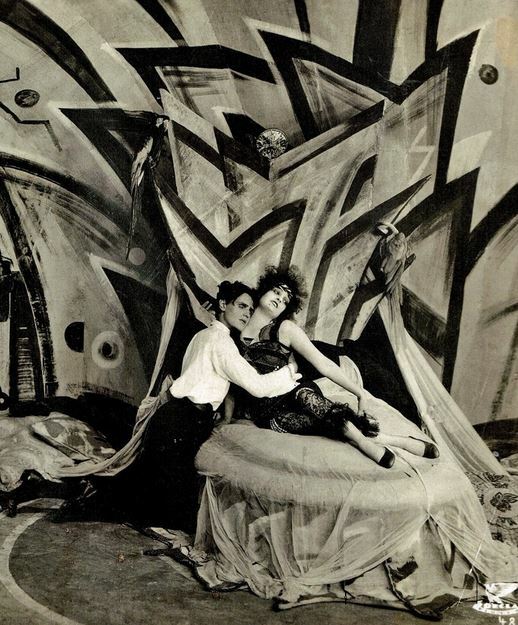 Murnau and Robert Wiene’s The Cabinet of Dr. Caligari — Fern Andra was almost a household name in Germany. Yet her roots were deep in the American Midwest. In addition to acting in bloody horror flicks, Fern worked as an American spy, married a German baron and a boxing champion, fell from the sky almost to her death with one of Germany’s great fighter pilots, and even tangled with one of the most evil men in history. 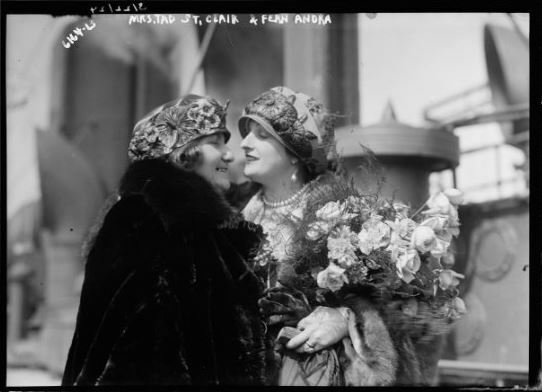 Fern Andra was born Vernal Edna Andrews in 1894 in Watseka, Illinois, a small Kankakee Valley farm town about fifteen miles west of Kentland, Indiana. Her parents were William P. Andrews and Sarah Emily Evett, also known as Sadie. When Fern’s father died in 1898, Sadie remarried Frank St. Clair, a vaudeville actor, circus performer, and tight-rope walker. Learning stunts from her stepfather, Fern began her stage career at the Stephens Brothers Opera House in Watseka. Aged ten or eleven, she headed to Chicago with a theatrical troupe, performing at the Globe Theatre. Between about 1905 and 1913, Fern went to school in Hammond, Indiana, where her mother and stepfather had relocated. Sadie St. Clair owned or rented a house at 184 State Street and later lived in Gary. Her daughter was remembered as a “Hammond girl” and would often come back and visit her family in northwest Indiana. By 1914, when World War I broke out, 20-year-old Fern had gone to Europe, where she was a popular stunt performer and minor stage actress. That year, she found herself trapped in Germany. But since the U.S. didn’t go to war against the Kaiser’s armies until 1917, she wasn’t considered an enemy alien and was even offered movie contracts. 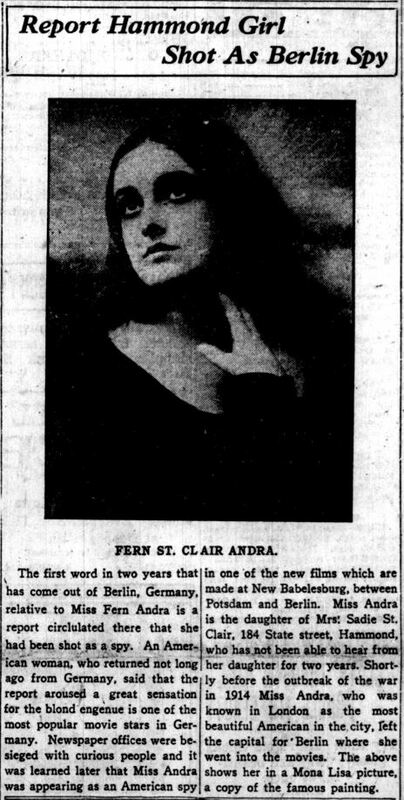 As “Fern Andrée,” she had already appeared in silent short films called Das Ave Maria (1913) and Mondfischerin (“The Fisher of the Moon,” 1914). 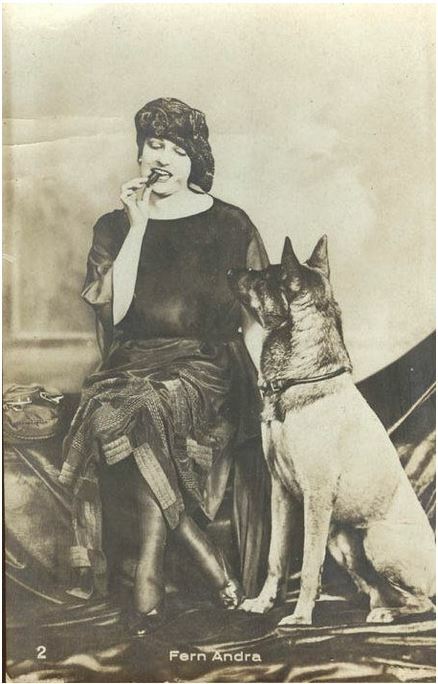 During World War I, the midwestern actress starred in over twenty German films. She had probably become fluent in the language by then, but since these movies were all silent, her nationality wasn’t important. . . until she was accused of being an American spy. Ogden Standard-Examiner, Ogden, Utah, November 27, 1927. It was true, but not for the reasons they thought. Actually, I was a courier, memorizing coded messages and repeating them to American contacts in Copenhagen… I was lucky. I was a movie star at the time, living in Berlin and a friend of the royal family. To save me, it was arranged for me to marry Baron Frederick von und zu Weichs, a member of the Hohenzollern family. 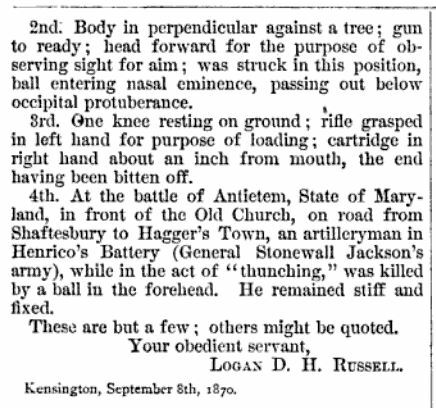 The rumor in America, however, was that Fern had been condemned to death by a firing squad. Gossip about her death came out in the Hammond paper just three days before the war ended. Bavarian Baron Friedrich von und zu Weichs was said to be a nephew of Zita, the last Empress of Austria. 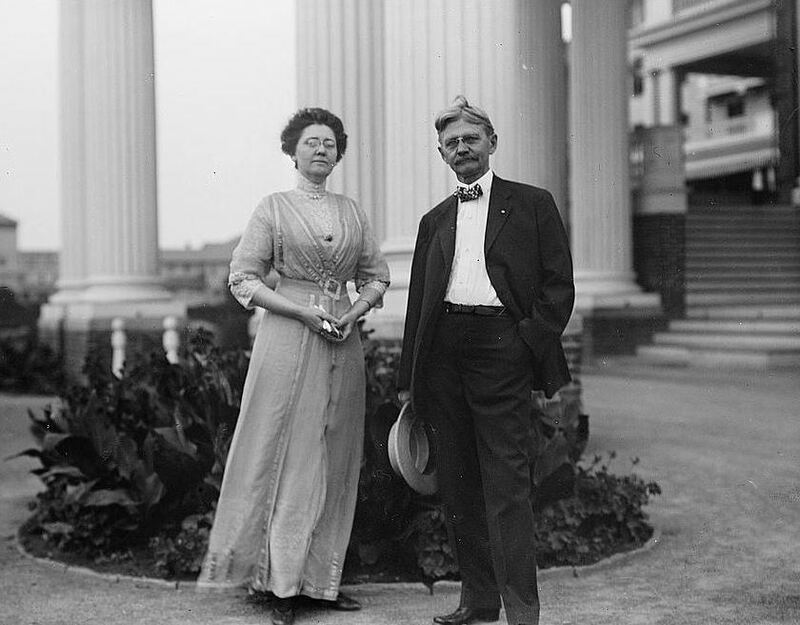 Fern and Friedrich were married September 28, 1918, and the “Hammond girl” immediately became Baroness Weichs. 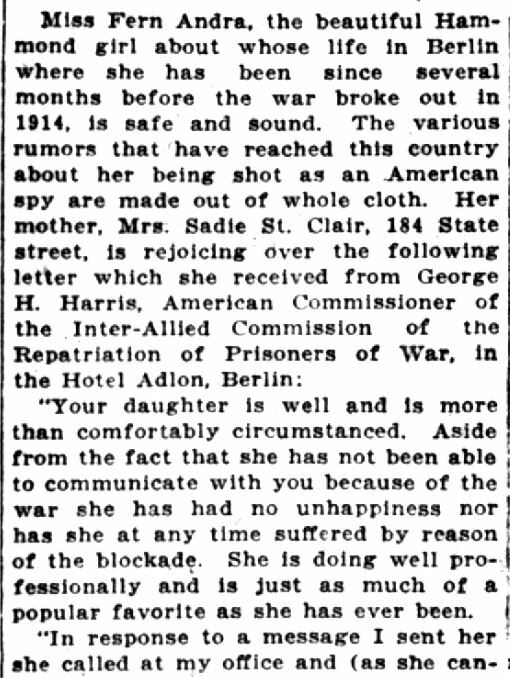 About a month later, just a few weeks before the war ended, her husband was killed on the Western Front. Fortunately, she’d come into some money. 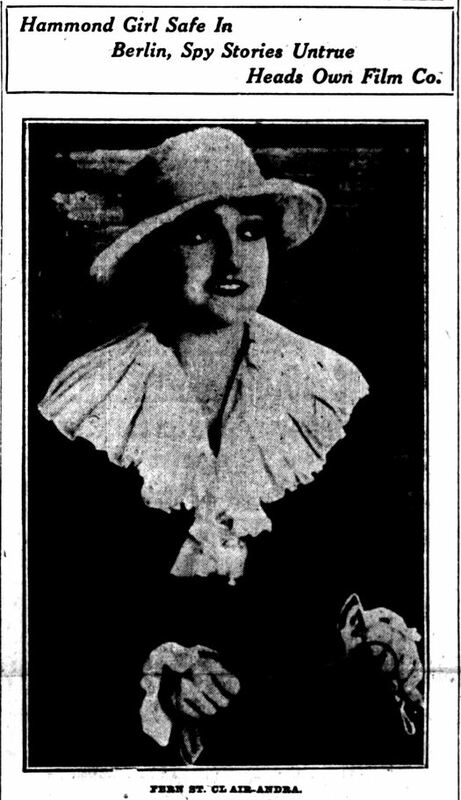 By 1919, when the former Hoosier girl made the front page of the Lake County Times, Baroness Fern, who had briefly been detained as a P.O.W., was running her own film company in Berlin. Fern Andra — LC Times, May 3, 1919Lake County Times, May 3, 1919. 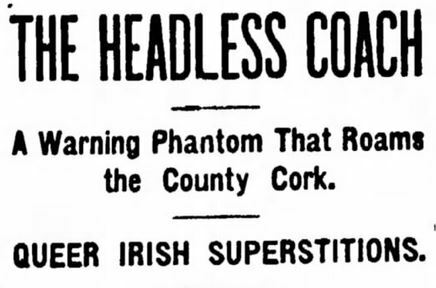 Lake County Times, May 3, 1919. Hoosier State Chronicles. Though its military was banned and its economy was in shambles, as the Jazz Age dawned, Germany entered a period of cultural brilliance known as the “Weimar Era.” Berlin in the 1920s was chaotic but saw the rise of iconic German geniuses like the Bauhaus architects, Expressionist filmmakers and painters, and some of the best-known German philosophers and writers. Fern Andra was part of this incredible, if often bizarre, cultural cocktail. In 1920, she played a leading role in a new Stummfilm (silent film) called Genuine: A Tale of a Vampire. Made by filmmaker Robert Wiene, Genuine was filmed in the same vein, part-horror/part-fantasy, of Murnau’s vampiric Nosferatu. Fern plays a high priestess, named “Genuine,” who steps out of a painting and comes to life, then turns to bloodsucking. 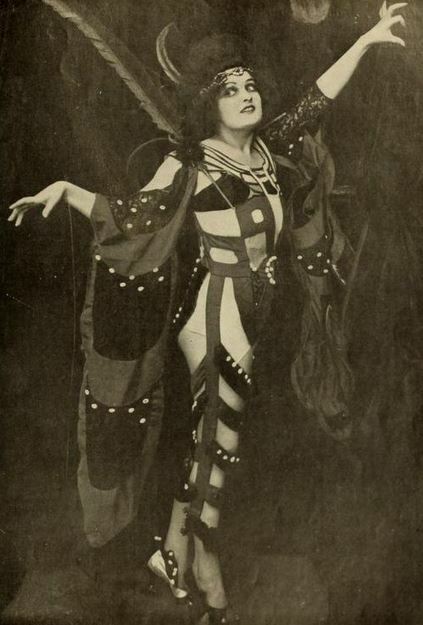 In one scene, Andra caused a sensation by appearing in an outfit that had merely been painted onto her body. 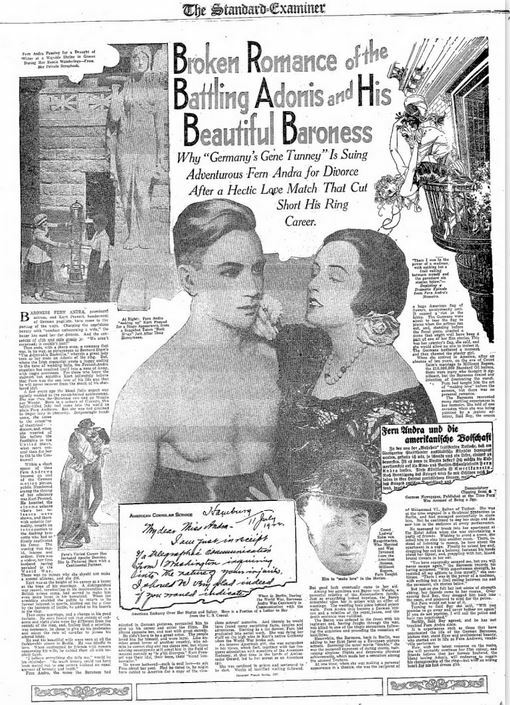 Though it starred the actress hailed by many as “the most beautiful girl in Europe,” Wiene’s film wasn’t well-liked and critics called it a failure. Twenty-first-century moviegoers would like it even less, but its stage design and outrageous costumes are still interesting — if only for the background, which evokes the kind of graffiti you could see sprayed on the side of a Burlington Northern freight car. 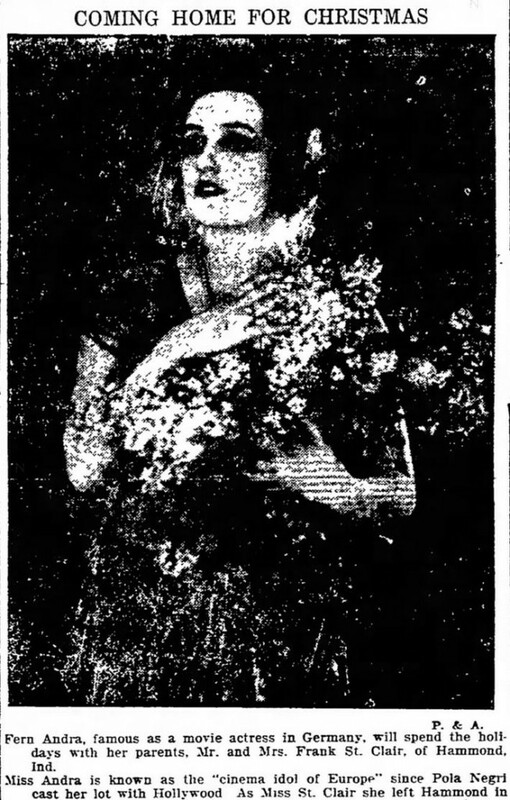 Fern Andra played a painting come to life in the 1920 film Genuine. Genuine played at the Marmorhaus on the Kurfürstendamm in 1920. Fern in a characteristic Weimar-era outfit. When Genuine hit the silver screen, World War I was over. But in 1921, Fern Andra was involved in a famous accident that cost the life of one of Germany’s greatest fighter pilots. 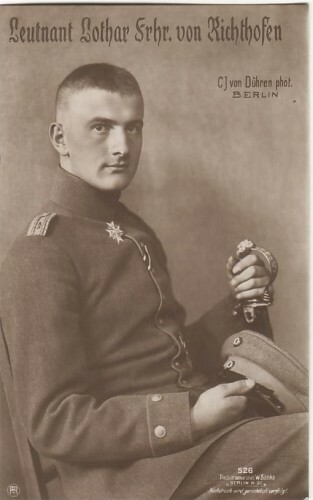 Lothar von Richthofen was the younger brother of Manfred van Richthofen, best-known to Americans as the “Red Baron,” Germany’s ace warrior of the sky. Manfred was shot down and killed over France in April 1918, but Lothar was almost as famous. After the war, he worked as an airmail pilot and taxied passengers between Hamburg and Berlin. On July 4, 1922, while flying Fern Andra and her director Georg Bluen into Hamburg’s Fuhlsbüttel Airport, Richthofen’s engine gave out and the plane crashed. The great pilot was killed, but Andra and Bluen, though injured, survived. Lothar von Richthofen died while flying Fern Andra to Hamburg in 1922. In 1923, the Hoosier beauty married German middleweight boxing champion Kurt Prenzel, who had been interned as a POW at Knockaloe on the Isle of Man. In 1925, Prenzel saved his wife from being bitten by a supposedly rabid dog and suffered a bite that kept him from boxing for about a year, a fact that reportedly figured into their divorce around the time he emigrated to New York City in 1928. Fern and her second husband, German boxing champion Kurt Prenzel, circa 1925. He had fought African American boxer Jimmy Lyggett, Sr., around 1920. In addition to acting, Fern wrote or directed about twenty German films, but called her German film career quits in 1927. Her last movie made there was Funkzauber (Radio Magic). 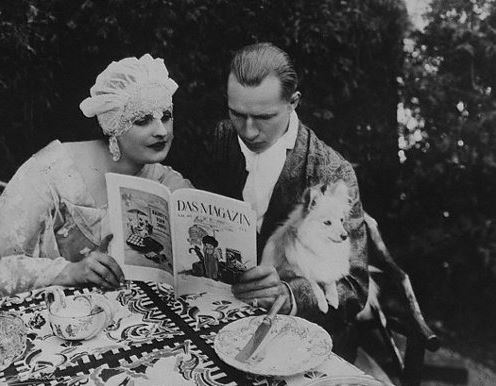 Until about 1930, she remained active in the Hollywood film business, and even married actor Ian Keith in Tijuana, Mexico, in 1934. Keith would star as Octavian in Cecil B. DeMille’s Cleopatra and as Bill Thorpe, a Louisiana gambler, in the John Wayne film The Big Trail. Andra and Keith divorced in Chicago a year after their wedding. Meanwhile, she was paying visits to her mother, Sadie St. Clair. In the 1930s, Sadie was living at 636 Washington Street in Gary, Indiana, in “a crowded flat over a furniture store.” The address is right across the street from one of Gary’s most iconic and photographed ruins, the abandoned City United Methodist Church. Though it has sat empty and gutted since the late 1970s, plans are on the table to transform the old church into a European-style “ruin garden.” The German Expressionists would have been the first to use this gloomy Rust Belt ruin in their films. One can easily imagine the specters of F.W. Murnau and Robert Wiene creeping out of the choir stalls, and Fritz Lang would have been fascinated by the fiery steel mills and modernist clamor of Gary before the city slipped into decline. 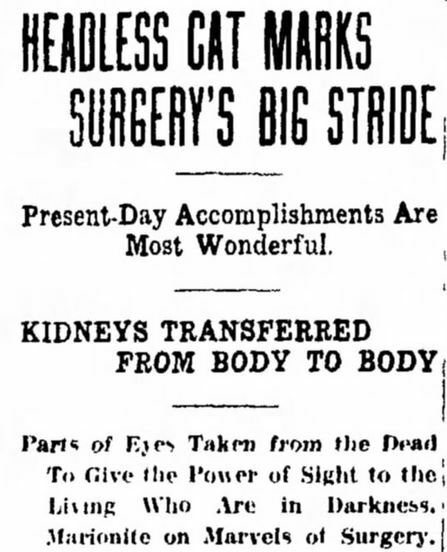 Lincoln Evening Journal, Lincoln, Nebraska, December 22, 1923. Fern with her mother on board a steamship, circa 1930. Sadie St. Clair, daughter of Midwestern pioneers, died in Hessen, Germany, in 1955. Her ashes were scattered in the Iroquois River in northern Illinois. 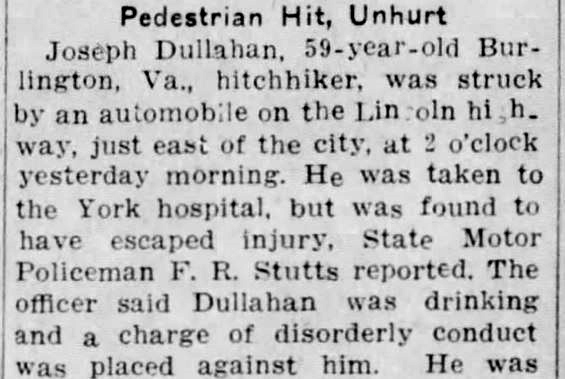 Springfield Republican, Springfield, MO, February 28, 1924. 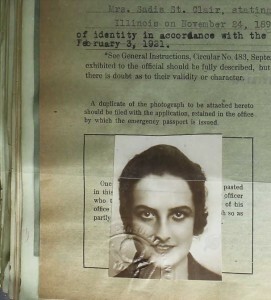 Andra’s emergency passport application, 1921. Though she was spending most of her time in California by this time, Fern’s involvement with Germany wasn’t over. In the early 1930’s, she challenged the rise of Nazism. The militaristic party of thugs opposed almost everything Weimar culture stood for, to the point of burning its books and destroying its art. There had once been unconfirmed rumors that Fern had had a love affair with Adolf Hitler’s “Minister of Public Enlightenment and Propaganda.” Andra apparently knew the despised propagandist Joseph Goebbels before his rise to power, and she remembered him later as a “mousy tutor.” (Goebbels had studied philosophy at the University of Heidelberg and was the perfect example of a good education gone awry.) In 1937, Andra and Goebbels clashed over the freedom of foreign artists to be active in Nazi Germany. She had even testified before the U.S. Congress about the Third Reich’s discrimination against non-Aryan artists. Engaging in a “verbal fusillade,” according to one account, Goebbels and Andra got into a fight during which the Propaganda Minister threatened to imprison her. He then systematically went about trashing her reputation, even claiming that she was a Hungarian impostor, not an American. If sources are correct (and there’s a chance they’re exaggerated) Fern escaped by plane into Romania, then headed back to the United States. Since she spoke fluent German, she aided the Allies during World War II by broadcasting radio messages into Germany. Her enemy Goebbels, Hitler’s master of lies, committed suicide in 1945 — after murdering his own children. Fern Andra continued to visit and live in Germany after the war. 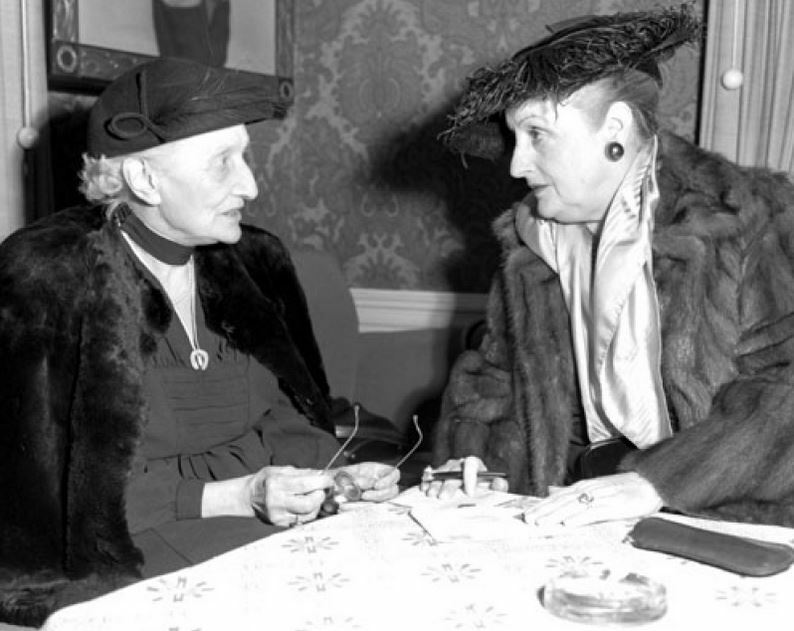 In November 1954, she was photographed talking to Baroness Kunigunde von Richthofen, mother of Manfred and Lothar. They met up at the American Civilian Club in Wiesbaden. Fern Andra, right, with “The Red Baron’s” mother, Wiesbaden, Germany, 1954. Fern and her fourth husband, a playwright and soldier from Connecticut named General Samuel Edge Dockrell, seem to have lived in Wiesbaden and New England until the early 1970s, but often visited the Midwest. 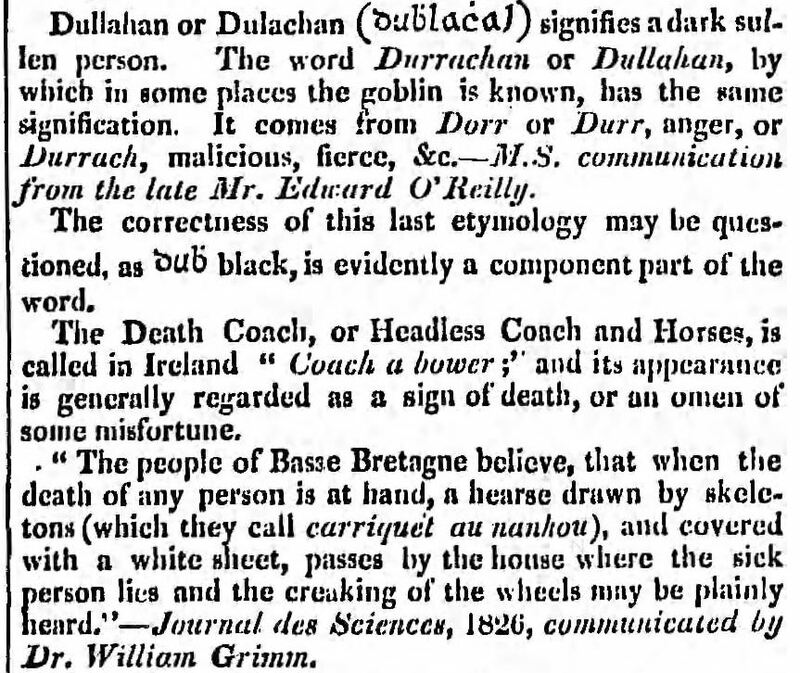 They eventually moved to South Carolina, where Dockrell died two days after they got there. Baroness Fern Andra, Hammond girl, succumbed to cancer at Azalea Woods Nursing Home in Aiken, South Carolina, at age 80 on February 8, 1974. Her fame vanished in the 1940s, and few Americans would know her name today. But Hoosier State Chronicles would like to put her back out there as one of the most interesting women who has ever lived within the borders of our state.